Hopefully you’ve found DriveBC to be a pretty useful tool when planning your trips around British Columbia. Road trips, work trips, transporting goods trips, camping trips, emergency trips…there’s a lot of different reasons we hit the road and we want to make sure you’re as informed as possible before you leave home or head home. We’ve now just added a bit more info to help you know before you go in Metro Vancouver. In real-time. Developed by TransLink with support from Transport Canada and the BC government, the map covers Highway 1 from Whistler to Chilliwack, Highway 99 from the Peace Arch Border Crossing to Whistler, all other numbered highways and major roadways in Metro Vancouver. It covers a lot. And to be as useful, and up to date as possible, the map is based on anonymous tracking of cell phone signals using GPS technology. 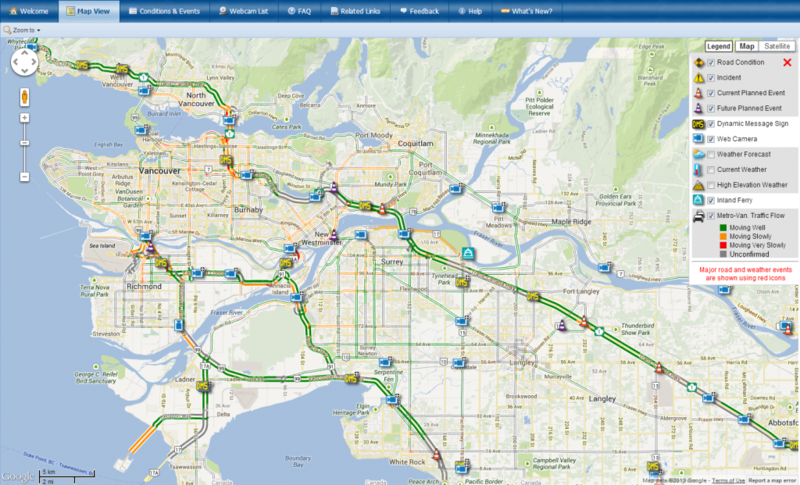 As the cell phone signals move around the Lower Mainland, they generate the real-time traffic flow measurements, which are translated into the online map. Privacy is really important to us so to maintain it, any personal data from cell phones is removed before it is used in the map system. “And while drivers get the latest details on driving conditions, we’ve also got a great new tool to study and improve traffic flows in our region.” – Doug Kelsey, TransLink Chief Operating Officer. We hope you like this new service. As always, we’d also love your feedback, which you can share below in the comments or directly through the DriveBC feedback form. We’re always looking at ways to improve DriveBC and we’ve been incorporating new features over the last two years to make the site more useful. Have you tried Plan Your Route? This cool tool helps you map your trip, showing the Google trip planner along with highway cameras along a chosen route. Or have you registered for text messages and email to receive up-to-date DriveBC information? So whatever reason you’re taking a drive, across BC or through Metro Vancouver, you have more ways to know before you go. Umm. So where is this traffic map? It clearly isn’t on your drivebc.ca map page!!?? Sorry you couldn’t find it but the map is on DriveBC.ca. Click on the MAP VIEW tab at the top of the screen. Then, on the far right, there are a list of check boxes to choose from. At the very bottom is METRO VAN TRAFFIC FLOW. Once you click on that, you should see the traffic map. Hope that helps.